Ah, now things are settling into a nice rhythm and groove. It’s not as if the actors playing the various parts haven’t been good till now, but having been a fan of these books for like fifteen years, I needed them to settle into their parts completely. I think Daenerys and Catelyn especially take their roles to new levels in this episode. Titled “Cripples, Bastards and Broken Things”, the 4th episode of HBO’s GAME OF THRONES starts to set the bigger machinations of the first book into play, and it’s nice to see that at only episode 4 of 10, things seem ready to ramp up to level ten as of episode 5. The production is again, gorgeous across the board. With the series still staying fairly close to the book, the writing is well done and everything that needs to be represented is. Bran. Here we start to see one of the larger plot arcs, and that would be Bran's dreams and most especially the 3-eyed crow, show up...those who haven't read the books, this will make more sense down the line, trust me. Bran being a fave character in the books, it's nice to see this attention to his character being paid early on. Also, Hodor! Hodor, Bran's large stablehand friend (and /transport/carrier) who is simple (and only ever says "Hodor" to varying degrees) shows up in a part that I am sure is hard to play, and it is done justice to the books. Dany starts to show her true character arc, one in which she is NOT to be messed with, and with the collected might of Khal Drogo’s Bloodriders (his bodyguards, and therefore hers as well) and that of Ser Jorah Mormont, her nasty brother Viserys finally starts to see that he is Dragon of nothing. Meanwhile at the Wall, Jon Snow meets one of my favourite characters from the books, namely one Samwell Tarly. John Bradley-West plays the character of fat craven Sam with such an amazing sense of depth that I was rather stunned by his performance and I think he stole the show. His beatings at the hands of the crueler recruits of the Night’s Watch and then Jon, Pip, and Grenn’s later defense of him (including our first look at Jon’s now bigger albino direwolf Ghost) is spot on perfect. The piece that totally steals the show is his response to Jon asking him about being a craven and why he would take the Black in such a case. There is a raw, thick emotion to his voice as he relates the story of his father’s (Randyll, Lord of House Tarly in the South) threat that he go to the wall and join the Night's Watch or Randyll would have him killed in an “accident”…as according to his father he is not FIT to inherit the Tarly lands. That scene is so well done on Bradley-West’s part that I was sold on him as Samwell completely. Sam is such an amazingly realistic character, and one that as the general public we can immediately identify...simply because he's not special, he can't do anything to become special, and in the end he is as everyday as it gets. To me this is why he hits home with us. Tyrion, on his way south from the Wall stops in Winterfell and gets a cold welcome from Robb (Lord Stark while his father is away), but he then proceeds to help Bran cope with being a cripple by giving him a saddle design that will allow him to ride a horse. This is so key, because up till this point Catelyn and others have made him suspect (especially last week when Littlefinger mentioned he lost the dagger that nearly took Bran’s life to the imp in a wager) in the attempted assassination on Bran. This starts to show that while Tyrion is as ruthless as his brother and sister, there is something in him that causes him to be honorable as well. It was nice to see that show up, and once again Dinklage owns every scene he is in. 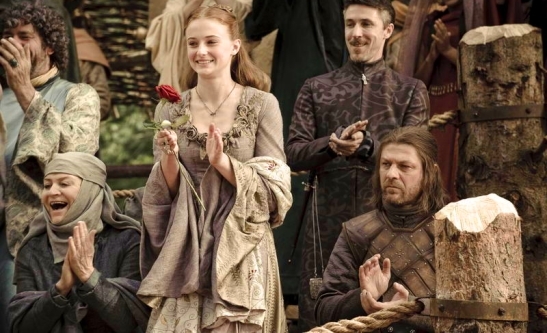 This point is even more illustrated later on in the episode when Catelyn and Rodrick Cassel are at the inn and she calls the bannermen of her father’s house to her aid in accusing Tyrion of organizing the assassination attempt and taking him prisoner. I like that because it’s one of those things that really shows Catelyn for what she is, a mother who will do anything at her wits end. Tyrion is clearly innocent of the charge since he is the smartest of the Lannister brood and would never do something so plainly stupid as hire a common thug for the job. If he had organized it, he’d have hired a Faceless Man of Braavos (assassin culture across the narrow sea) and Bran would be dead. No, he didn’t do it, and finally we start to see that to be the case. Tyrion also has a quick scene with Theon Greyjoy, ward of Ned Stark. It’s a nice little scene that explains the backstory of Balon Greyjoy’s (Theon’s father) rebellion when Robert was first on the throne, how that rebellion was subsequently put down and Theon taken as a ward/captive for Balon’s good behavior. Since the Greyjoys take a much bigger role in the story down the road, this was a nice little preliminary setup piece that I quite liked. The Tourney. Ah, this is great scene. Why? Because it is paid little attention to. Ned doesn’t want the Tourney to happen at all, and so the first part of it (the rest will show in the next episode) is treated almost as an afterthought. I liked that. Here we have the last remnant of Jon Arryn’s time as Hand (in the form of his squire-turned-knight Ser Hugh) taken out. Thus do we get our first look at Gregor Clegane (the Hound’s brother), otherwise called the Mountain That Rides and he is absolutely huge and quite menacing. We get our first real death, and it’s a gory one (kudos to HBO for not skimping on the gore). Then there's King Robert (who in the books I actually had more respect for) who continues to prove that in his old age he is a fat, drunk, whoring, piss poor king making bad judgments. It clearly illustrates that Robert’s best time is in the past when he was a young warrior and he stood for something righteous and just. It continues to reveal that he is not even a shadow of that person anymore and Ned clearly sees it. Robert has literally beggared the realm to Lord Tywin Lannister (Cersei, Jamie and Tyrion’s father) paying for excesses. It should be noted that there are a number of scene’s that aren’t in the book within this episode. They are small scenes, and I don’t feel like they detract from the story at all. One with Arya speaking with Ned about her future is actually very poignant and simply adds to her character plotline. There is one between Jaime and Jory Cassel that is excellent at demonstrating not only Roberts’ treatment of his Queen (whether it is deserved or not), but also shows how when talking about war, battles and glory Jamie is jovial and forthcoming, but the minute he is not speaking of such things he goes right back to being the arrogant, incestuous Kingslayer. Nice character building for Jaime there. The last scene I should talk about is Littlefinger’s story about brothers The Hound and The Mountain (Sandor and Gregor Clegane) and their loathing of each other, including the revelation that Gregor is actually responsible for the Hound’s face being burned and melted. Now, in the books The Hound himself tells Sansa this story, but I can understand why they chose to let Littlefinger tell it (you'll see) and I’m not bothered by him doing so at all. My issue is that after Ser Hugh & Gregor’s joust ends, the crowd just kind of sits there in hushed whispers not really talking…giving Littlefinger five minutes of utter quiet in which to tell his story. It comes off as odd to be honest. I’d much rather if the silence was for us the audience alone, like it muffles as he tells Sansa the story, and then un-muffles and you hear the crowd again after he finishes. It would have made more sense really. The way it was done makes the scene stand out like a sore thumb sadly. That said, it is a great piece of exposition so i am not that upset. Overall another great episode and it really sets the stage for the 5th episode, which is where all the action starts to go down and the pieces that have been laid out thus far begin to really move. I really think the best scene in the whole of episode 4 is the one between Jon Snow and Samwell on the Wall though. In the next episode: Look for the Tourney to continue and The Mountain That Rides will take on Knight of the Flowers, Loras Tyrell...who is an interesting character in his own right. This show was brilliant, I can't wait until tomorrow's episode. Great shows leave me thinking about them for the whole week, and GoT has yet to not accomplish that. Working for DISH Network I know you can catch it on channel 300 HBO in beautiful HD with DISH. With beautiful scenery, shots of the wall and King's Landing, the only real way to watch is in HD. Nobody does high definition like DISH Network does.